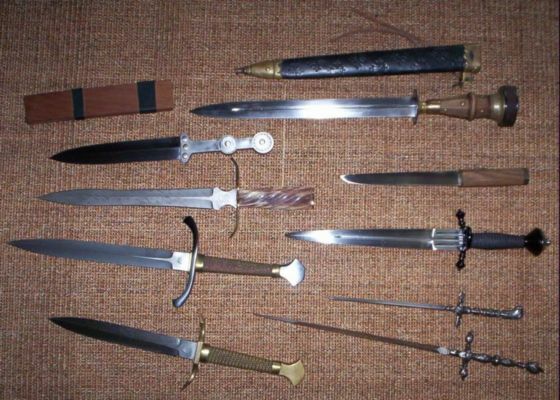 Swords get a lot of press around here, but daggers are essential items for most collectors. I thought a new thread for people to showcase the daggers from their collections would be fun. We have a "Your last sword" thread, but here you can show off any and all daggers from your collection you think people might want to see. Groups shots of all the daggers in your collection would be great, but individual shots are welcome, too. I have several daggers but this rondel is the only one that I help build. I did the bronze rondels and provided the blade. A friend of mine made the cocobolo handle. The blade is 5160 at R50 or so and is 12" long. I've carried this guy for a long time. Windlass Scottish dagger...companion to my Scottish back-sword formely owned by our man Nathan.. I've always thought that one was cool. Do you have pictures of your other daggers? This thread is not limited just to your last/latest. Here's a few I made myself. There's something very satisfying about making a dagger, possibly because it's not too big a project and daggers are such 'personal' weapons/tools that you can put a lot of yourself into them. The A&A classic dagger is a good one. I kind of have one. The second dagger from the top in my pics above was once a bronze-hilted A&A classic dagger. I then had the guard changed to the straight Crusader guard. Then I re-wrapped the grip with cord and leather. I like the end result. Those are pretty nice. What kind of steel and wood are they? This is a Scramasax from Hanwei / Paul Chen's factory. I've had it a few years. It's got a very nice blade-heavy feel to it. The scabard is fairly heavy leather. This one is not really historically accurate... it was custom made for me by a local smith. I'm very fond of two very different cultures -- Celtic / Viking / Norse, and Japanese. 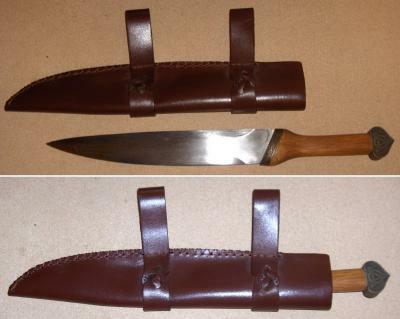 It is pattern welded, forged in a Norse / Viking style but the blade shape of course is a Tanto. After receiving the bare blade, I finished the knife myself. 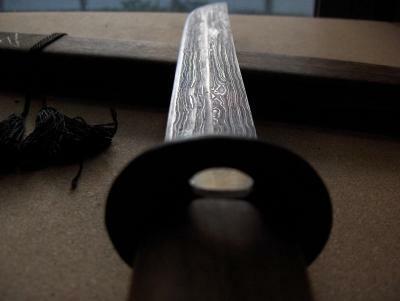 The handle, scabard, and habaki were all self-made, the tsuba is an antique from Japan. A couple more pictures of these two are in the Gallery. 2. Hunting dagger/sword, early 18th c., English, Silver mounts, double edged hollow ground blade 21 inches. One of my all time favorites. Wish it was in better shape. Beautiful hollow grinding. quillons are dogs. Ebony handle. 3. 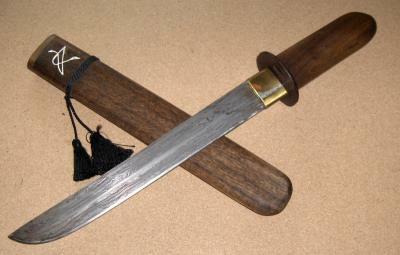 Short sword, Austrian, early 19th c. double edged, 18 inches. Interesting brass on this - very light in color (high in tin). Probably made that way due to shortages of material in wartime. If I had to grab a short blade to defend myself this would be it. 4. 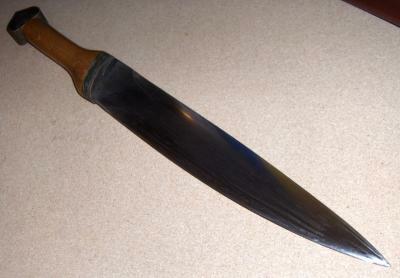 Kukri, Mark III 1944. Personally, I would not want to mess with someone who had this in hand and knew how to use it. 7. Serpent in the steel #9, J Arthur Loose. Integral guard. One piece of steel folded into shape. Amazing work that guy does! 8. 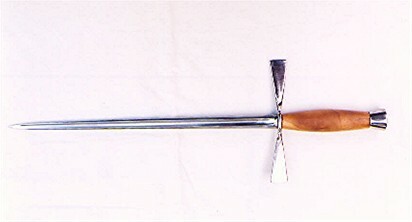 Reproduction Jacobite Dirk, Michael Tinker Pearce. Based on 'Swords and the Sorrows' 2:6. 10. Tibetan or Bhutanese dagger, single edged, early-mid 20th c. Nice silver mounts. Hairpin folding. Here is my collection (or all but two of them). Some are recognizible, some more obscure. See if you can ID them all! Not sure about the top two, the bottom 3 on the left are probably Hrisoulas pieces, the bottom 2 definitely are. On the right it looks like 3 arms and armor pieces (gustav, medieval knife, italian stilleto) and the bottom one I'm not sure of but guessing MRL? Unfortunately, I don't make the blades myself (I wish I had a forge!). I tend to buy in blanks or recycle old blades and grind them to suit my purposes. The top dagger has a Yew wood handle and sheath and an old FS blade. 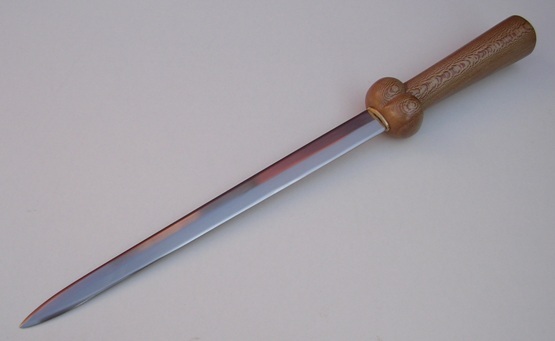 The bollock dagger has a 10" blade from a French maker, with a Lacewood grip. The 14" Misericordia is the top half of a blade from an old (repro) rapier (the bottom half of which I used to make a parrying dagger for WMA). The grip is Lacewood. Below is another dagger I made using an old FS blade that I cleaned up. The handle and sheath are Laburnum. 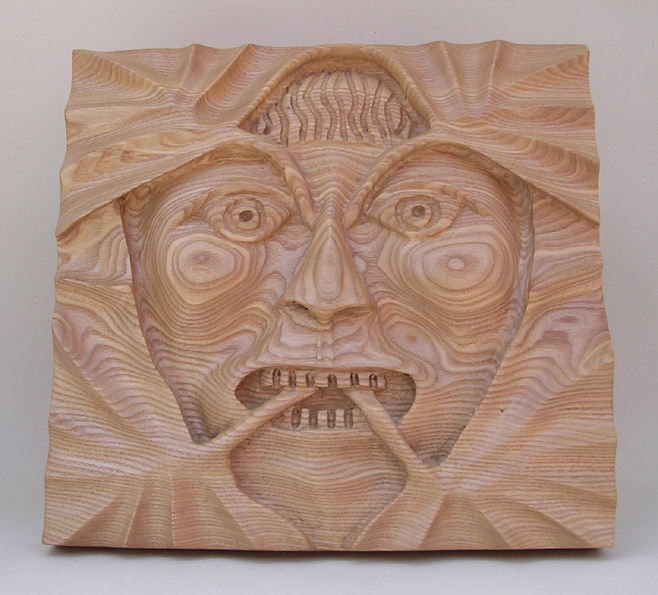 I love working in nicely figured wood, as my main hobby is Mediaeval decorative woodcarving (see Green Man below - sorry, it's off-topic). I also pick up the odd interesting piece that catches my eye, such as the antique stylet dagger. 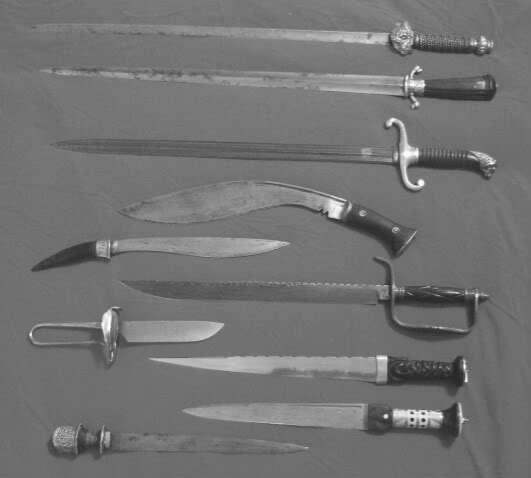 I could add to this thread but most of the daggers I have owned are ones that I have made, and all have been sold and are therefore no longer in my collection. Being a part-time custom maker I'm not sure if it would be considered a plug to post pictures of them to begin with. In any event this thread is an interesting one to me, I would love to see more of what folks have been collecting in the way of daggers. Thanks to those who have shared! - The Hrisoulas piece you were unsure of is one of his cable welded jobs. Got it for a relative pittance off of eBay awhile ago. Its not my favorite, but it is very interesting. 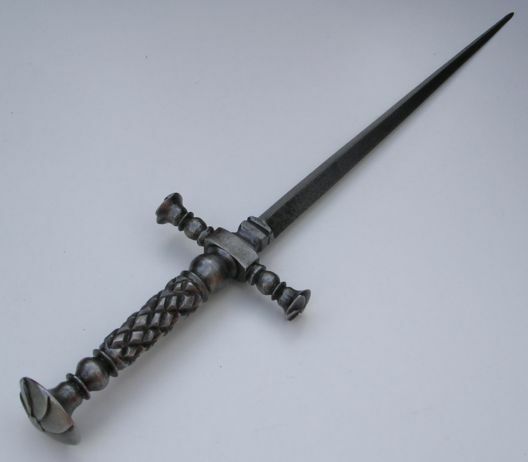 - The Gustav parrying dagger is actually a semi-custom piece that I got just a few months ago. I had the folks at A&A use the Gustav hilt with the blade from the Elector of Saxony, which is a little shorter and broader than the stock Gustav. I really like the look better. - The bottom right stiletto is indeed and old MRL piece, made in the US. The detail is not as good as the A&A stiletto, but it is still very nice. - The top right piece is rather unique. It started as a Steven Moffat job that I purchased second hand on eBay (along with a Gustav Vasa rapier, hence the need for me to order the parrying dagger from A&A!) but ended up being somewhat extensively refitted by myself. When I got it, I dismounted it to inspect and clean. In so doing I discovered that the blade had a crack in it. I mulled making a new blade, but in the interest of time ended up modifying a Windlass dagger blade (I had gotten it cheap on eBay) to fit the scabbard and to a lesser degree the existing fittings. The hilt is mostly the same, but I added the walnut spacer and had to replace one of the sandwich plates - it originally had a nice top plate with an etched or engraved design. But when I went to fire blacken what I thought was a steel plate it literally melted before my eyes - it was PEWTER!!! (missed the staff meeting on that one, I guess). No biggie, just wish I'd known that before I set to work. Cool! Of course that just means I've spent to much time staring at works by various makers. Apologies - Nathan is absolutely right, this is by Steven Moffat. I had no idea there were two separate individuals with the same uncommon last name. I had seen Randal posting quite a bit over the last several months or so and his name became stuck in my mind. Sorry for the confusion. I've edited my original post to have the correct attribution.